On Sunday, September 24, 2006, at 10:43 am, a 1966 Cessna 182, N2700Q, departed Phoenix Deer Valley Airport (KDVT) with full fuel tanks and disappeared. Although no flight plan was filed, it is believed the aircraft was headed for Sedona Airport (KSEZ) and was expected to return to Deer Valley that same afternoon or evening. A radar contact that dropped off-screen approximately 9 miles southwest of Sedona is thought to have been the missing plane. Pilot: William Westover, age 54. Passenger: Marcy Randolph, age 43. During 2008, I was asked to help locate the missing aircraft by Phil Randolph, the father of Marcy Randolph. After viewing the radar plot left by the accident aircraft, it appeared to me that the aircraft was not flying directly toward Sedona, but toward the rugged Sycamore Canyon area. I concentrated my aerial searches in that location and one canyon that I looked at closely was Loy Canyon. It was a classic "Box Canyon" that could trap a novice pilot if he happened to fly up through it. From what I was told about the pilot he was very inexperienced and took risks while flying. A bad combination. The canyon, as most in the area was steep and heavily wooded. I never spotted any wreckage in the canyon. Other searchers were helping the Randolph family too. During one searcher's random check of Forest Service fire records in the area, a fire was was found to have been reported by hikers on the day of the accident. 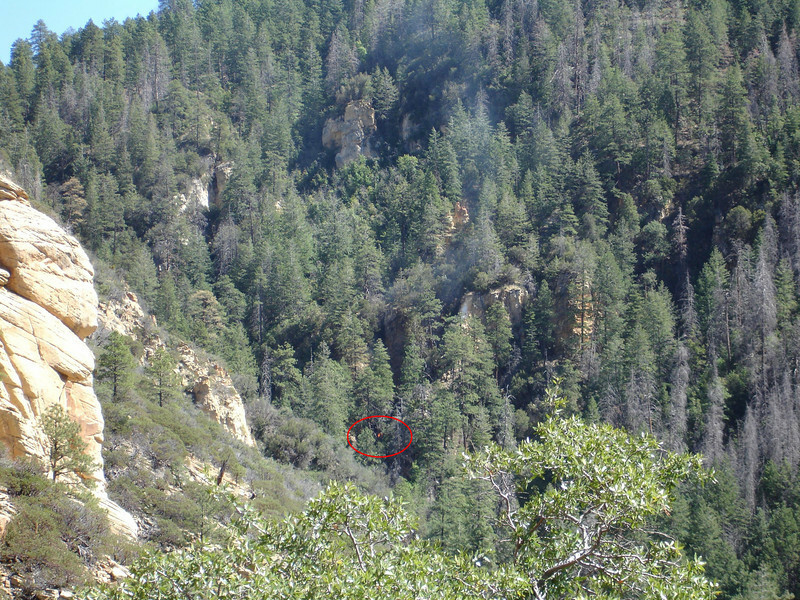 The location of the reported fire: Loy Canyon. On April 19, 2009, a search party began the hike down the canyon. With the aid of a photo taken of the fire by one of the hikers, a search of Loy Canyon revealed the missing Cessna and it's occupants. 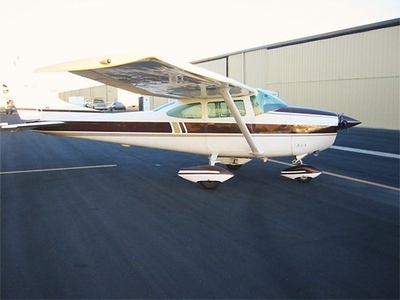 The aircraft (N2700Q) was a 1967 Cessna 182K, serial number 18257900. The total airframe hours were 7,079.51. The aircraft was owned by Phoenix attorney William Westover. The pair were reported missing along with the aircraft. 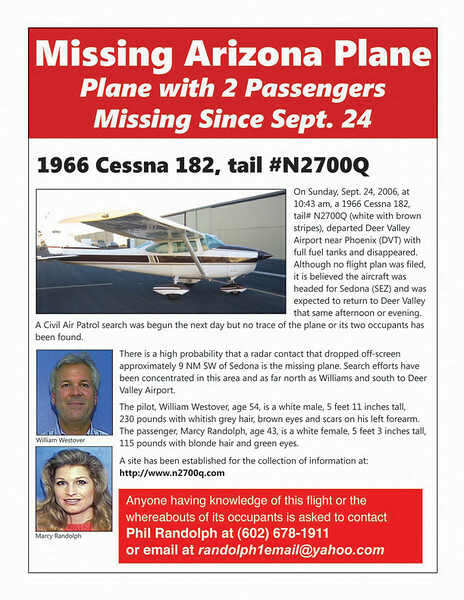 Flyers were posted at airports throughout the state during the 2 1/2 year search for the missing aircraft and it's occupants. 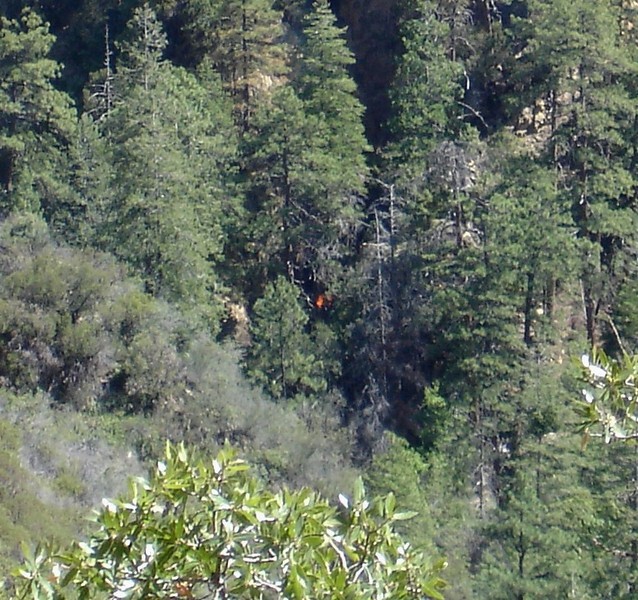 This photo was taken on the day of the accident by a group of hikers in Loy Canyon. The group spotted smoke and a small fire around mid-day at the bottom of the canyon. Having no idea of a missing plane, the fire was not given a closer look. The group did however report the fire to the United States Forest Service (USFS) Rangers. The USFS report of the fire was filed and no official agency involved in the search of N2700Q connected the fire report with the missing aircraft. The fire eventually burned itself out and the USFS never investigated it further. It would be 2 1/2 years later that a group of private individuals would find the USFS file of the reported fire and connect it with the missing aircraft. 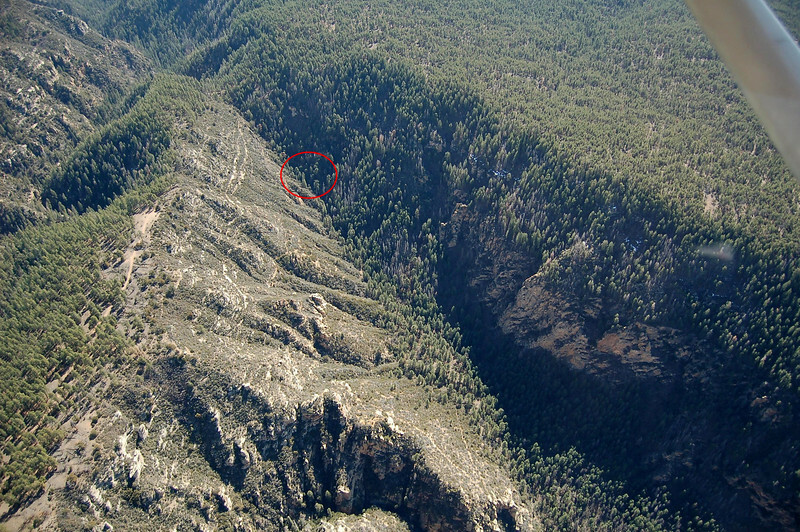 This aerial photo taken of Loy Canyon shows the location of the reported fire and accident site location of N2700Q marked by the red circle. 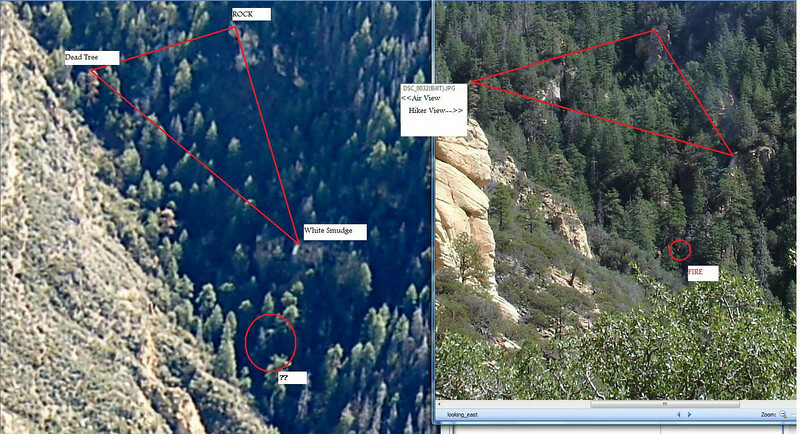 A photo comparison was made of the photo taken by the group of hikers and an aerial photo taken by a search aircraft.